"Suzz here .... I am finishing off this week with one of the Artemio Frames which is a fantastic surface to paint and stamp on". I painted the background with a lovely shade of Ice Blue Fresco Paint. I added smears of Snowflake to soften the blue. I wanted to bring in shades of pink into my project to highlight spring colors. I squirted a touch of Snowflake onto a sheet of acetate and spritzed Dylusions Pink Bubblegum into the paint. I mixed them together to create a soft pink color. I distressed the edges and the frame using Snowflake infused with pink. I used the same paint to paint a few mini spools, my pearl bauble, and some lace for the sides of the frame. I stamped the lovely image from Ink and Dog 02 using Versafine Majestic Blue ink onto the Smoothy White Stamping Card. I added color to the image using watercolor pencils and a waterbrush. I cut out the image and taped it to the background. To add shading around the image I colored with the watercolor pencil and waterbrush. I stamped the "courage" sentiment from the Hot Pick 1011 along the left side using Versafine Majestic Blue ink. To accessorize the frame I added the 7 Gypsies handle to the top and draped an old chain from the handle. I added Idea-ology baubles, chains, to the chain to drape over the edges. Hope you have enjoyed the week as much as I have. I will see you again back here the week beginning 25th March ... until then take care! Leandra Says: So cute, and mixing dye sprays with paint is such a great idea. Although, I accidentally found out one day that not all paints are compatible with all dye sprays. Lin B and I tried this once with a different brand of white paint and Ranger Cranberry Dye spray. We created a gelatinous mess - we ended up calling the goopy mess 'red snot' cos that's exactly how it went, all gluggy. Was utterly hilarious. So far, I have found Fresco snowflake is compatible with all dyes I have tried. Yay for that! 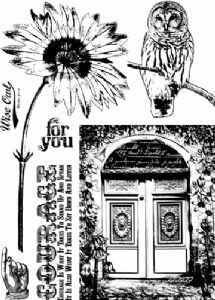 Gillian Says: A lovely project to finish the week off Suzz and great use of all the different stamps! "Today I am sharing a card with a few of my favorite things: Flowers, Vintage Bottles, and butterflies. I am also showing you the steps I used to create the background paper for my card. 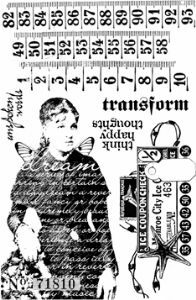 I was inspired by a piece of pattern paper which had me thinking how I could recreate it using some of the lovely PaperArtsy stamps". When I create a background I always create a larger piece to allow me to either chose the best part of my background for my project or to have leftovers for another project. I started with a piece of SmoothyWhite Stamping Card as my canvas. Stamp the "stripes" using Versafine Smokey Grey Ink randomly across the surface. 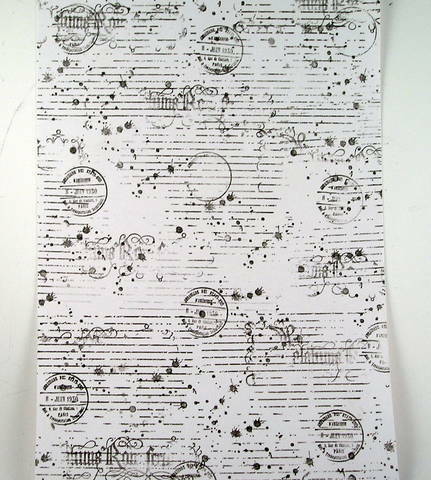 Next stamp the "circles" randomly across the surface as above. I used a lined acrylic block to help align the "lines" in the stamp which helped me keep my lines parallel to my background. Next step was to add a partial flourish script, by appling uneven pressure to only pick up part of the script then I added the ink splats from (HPXTRA 01) across the page randomly using grey ink as above. "I have to say this image is rapidly becoming one of my favourites". 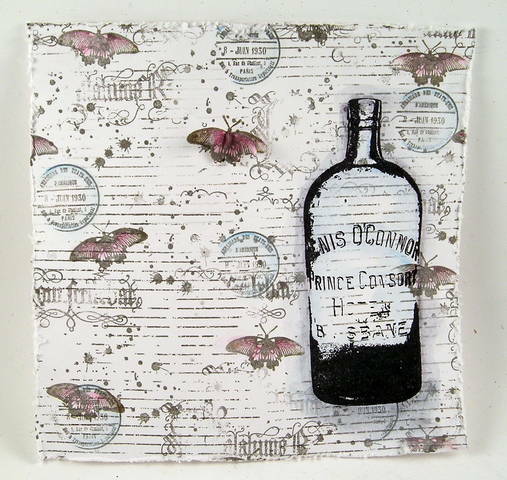 Next I added "moths" from (ID01) floating across the background also using Versafine Ink. I then added a hint of watercolor pencil to the circles and butterflies, using a waterbrush to soften the effect. I cut a piece of the background and stamped the bottle over the background using Archival Ink (Jet Black). I added a hint of blue watercolor pencil around the edges and shaded under the glass bottle. I stamped a second set of butterflies onto the Crackly Tissue Paper, using Versafine Ink, which was then heat set on the tissue paper. Again they were coloured using watercolor pencils and waterbrush. Next cut them out and attache them to the first layer of butterflies on the background. I also stamped two sets of the flowers using Archival Ink black onto Crackly Tissue Paper. I heat set it to ensure it was dry before I colored them with the watercolor pencils. I then cut the flowers out and attached them to the front of the card. 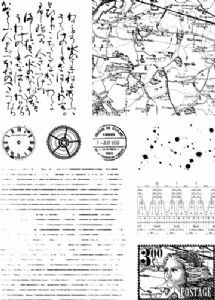 I hope this project inspires you to dig out your stamps and create your own background papers. See you same time again tomorrow! Leandra Says: I adore this soft gentle colour scheme, and how the little touches of grey make each element stand out off the background, what a great tip! Gillian Says: What a great idea Suzz when you don't have the perfect background papers. The flowers look striking against the white/black background. 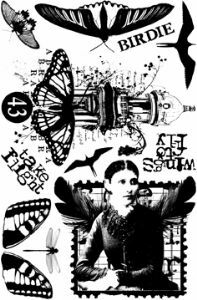 Don't forget to share your own creativity this week inspired by Suzz's posts, click HERE to upload your artwork to be in with a chance of winning some PaperArtsy Rubber Stamps.